Claresholm has all the ingredients to capitalize on opportunities in agriculture. So says Ted Menzies, former member of parliament for this area and an expert in agricultural issues. He was speaking to a crowd of about 70 people at the Claresholm branch of the Royal Canadian Legion on March 26. It was the second installment in Claresholm: Opportunities for Growth, an education presented by the Claresholm and District Chamber of Commerce and Claresholm Economic Development. The percentage of people farming has decreased from about 60 per cent in 1930 to around two per cent now. “We can’t just keep growing farms,” Menzies said, but instead have to be more productive. The world population is set to be 9.8 billion by the year 2050, meaning 70 per cent more food will be needed. Too much is grown here, so it has to be exported. However, it is expensive to ship, so it is better to add value here before shipping it out. There are also 925 million malnourished people in the world. Four of 30,000 edible plants provide 60 per cent of the world’s daily diet – rice, wheat, maize or corn, and potatoes. Three of those are grown here. Menzies outlined several issues in agriculture such as changing dietary patterns; climate change; the advent of soybeans here; keeping existing agri-food sustainable; and technological advances that add more value. 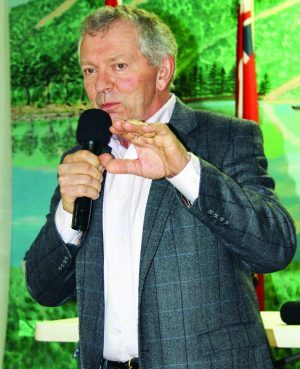 He said Claresholm has an advantage because of several factors: it has water; food is grown here already; there is a low cost base; it is on the Canamex highway; it has space; and it has the people. Worldwide agri-food is a $13 trillion market. Beef, pork, poultry, eggs, milk and other staples are not going anywhere. However in the area of plant protein, Canada and this area can differentiate itself. Generation Z, those people born from the mid-1990s to the early 2000s will make up 40 per cent of the food buyers by the year 2020. Their eating patterns include wanting food that is natural, high quality, and plant-based. This provides an opportunity with canola and soy, as well as aquaculture, which is expanding six per cent annually. Menzies turned his attention to protein. Canola meal sells for $250 per tonne. By 2050, plant protein will account for one third of the world protein market. An initiative called the Canada-U.S. strategy is developing a protein highway. It encompasses an area that includes Alberta, Saskatchewan, Manitoba, North and South Dakota, Minnesota, Nebraska, and Iowa. No place can produce as much protein as this region, and the demand for protein will double by 2040. The future of plant protein in Canada will involve Protein Industries Canada, which sees a variety of organizations including the Plant Protein Alliance of Alberta working together. Company creation, expansion and attraction will be supported as will the retrofitting of existing facilities. There will also be efforts at customer engagement and support. Industry partners will provide trade specific infrastructure, traceability is needed to ensure confidence in products, and there are opportunities for investment into import markets and customer relations. Moreover, there will be collaboration among these industries and federal government initiatives. Menzies concluded by saying a canola seed is 44 per cent oil. The key sources of protein remain eggs, chicken, pork, beef as well as dry peas, soybeans and canola. There are opportunities for meat protein as well. As an example, Cargill slaughters 4,700 animals a day. Overall though, this area is poised to take advantage of these opportunities.